Parking & Transportation Services coordinates and regulates the administration of the Parking Policy with respect to vehicle registration and parking enforcement in an effort to provide safe and available parking for all members of the campus community and their guests. We also manage the University Shuttle Service for our parking lots and off-site residence complexes as well as oversee the University Rental Fleet. 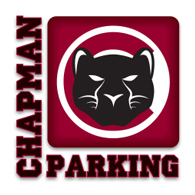 Should you have any questions regarding any of our services, please contact Parking Services at (714) 997-6560, (714) 997-6543 or parking@chapman.edu. If it is after hours or during the weekend please contact Public Safety Dispatch for assistance at (714) 997-6763. Worried about finding a spot?